The importance of buying a home goes far beyond finding a place that feels like home. This is likely the largest undiversified investment you will make. Especially in the Vancouver area, which according to Demographia is considered the second least affordable housing market, being a successful homeowner requires a dispassionate approach to buying a property. That’s all fine in theory, but when you’re actually buying a home, cruising around town with your Real Estate agent checking out listings is way more interesting than comparing interest rates and mortgage penalties. 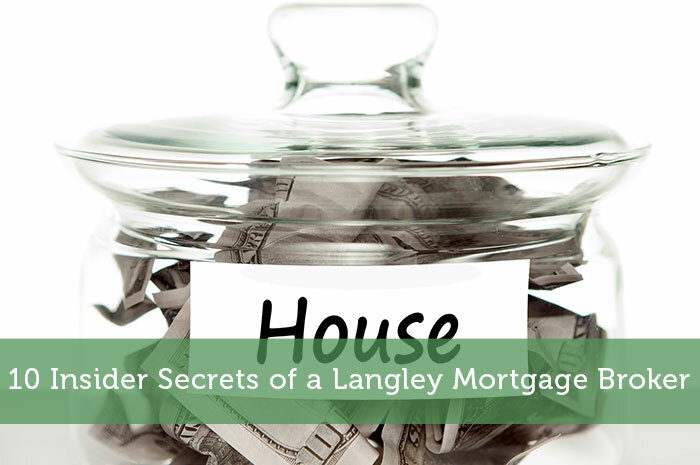 This article will give you ten practical tips to save money on your Langley mortgage, so you can get back to comparing Real Estate listings. Mortgage lending guidelines are getting tighter. Right now if you applied for a 5-year variable mortgage at 2.50%, you’d need to qualify for the mortgage at 4.79%. If you applied for a 5-year fixed mortgage at 2.99%, you’d need to qualify at 2.99 %. That means you can afford a lot more with a fixed mortgage. But that’s not always a good thing. Most people buy the biggest house the bank will approve, but they’re going to be in serious trouble if interest rates go up, or they’re hit with a (bad) financial surprise. Find out how much you qualify for, and then buy something smaller. In twenty years, you’ll be glad you did. Nothing kills equity quite like a brutal mortgage penalty. I’ve had clients looking to consolidate their credit card debt, only to be charged $10,000 by the bank because their terms didn’t allow for refinancing mid-term. Penalties on variable mortgages are pretty reasonable and quite easy to calculate, so if you see a better mortgage deal come along, or you simply want to sell your home, you’ll find yourself in a better position. For fixed rate mortgages, you need to watch something called the “posted rate”. It’s how many banks trick you into paying more for a penalty, using the Interest Rate Differential calculation. Compounding interest is incredibly powerful, but it’s a double-edged sword (I’m looking at you, credit cards). I’d suggest buying a smaller home than you can afford, amortize it over 25 or 30 years, but make payments as though you’re amortizing over 10 or 15 years. You can decrease the payments later if it’s too much to handle, but every extra dollar goes directly to the principal. If you’re paid on a weekly or bi-weekly basis, increase your mortgage payment frequency to weekly or bi-weekly. The effects of compounding interest will be leaning in your favor, and the total interest paid will go down substantially. Vancouver is a fun city, but it’s ridiculously expensive. You can find bigger homes at a more appealing price if you look outside the downtown core. With Translink finally starting to offer more rapid transit options, such as the rapid bus in Langley or the new Sky Train line being built in Coquitlam, the commute downtown is reasonably short. You’ll save on car insurance and gas, all of which could be applied to your mortgage! Just like buying a car, you need to comparison shop. Maybe even bring your knowledgeable friend along for the ride. Proper negotiating doesn’t need to take a long time, but it can save you a fortune in interest or penalties. Like any negotiation, be ready to walk away from the table. Know what matters to you and what doesn’t. Put yourself in control of your mortgage – nobody can care about your finances as much as you. Don’t stop shopping just because the deal has closed. Lenders have been known to inflate your renewal rate because most won’t bother demanding a better deal. Renewal letters are typically sent out about three to five weeks before your term expires, which isn’t much time. Start shopping around a few months before your term expires to make sure you’re really getting a good deal on your mortgage renewal. Okay this isn’t a strict rule; I’ve seen some great mortgages at big banks. But so many people simply call up one of the local banks, and accept whatever terms they offer, which is a fantastic way to overpay on your mortgage, if that’s your goal. Simply put, you don’t have much leverage walking into a bank. You need to really check out your options, compare offers and read the fine print. That’s where you find the real cost of anything. What’s the quickest way to shop the mortgage market? Use a mortgage broker, of course. Brokers deal with a number of different lenders from all over the country, but work for you, so you don’t have to spend a couple of days running from bank to bank. Housing prices in Vancouver is extremely over inflated, so every dollar you can save with your mortgage will help immensely. Thanks for the tips. I’ve always preferred to live in the Suburbs anyways. The intensity of the city is a bit too much for me. Add the financial advantage to being a bit away from it all, and we’ve got a perfect combination. When I was first looking to buy a house with a girlfriend, we were blown away at how much we were approved for. On the ride home, we discussed how actually taking a loan out for that amount of money would bankrupt us fairly quickly – even if the housing market hadn’t collapsed. When purchasing or selling a property, you should need a guidance from a right mortgage broker to make this process easier. Because, home buying is one of the biggest investment of every person around the world. As a first time home buyer, you should need a right mortgage for the successful real estate process. Because, they are well trained professionals and having access to huge lenders around the area or region. As a first time home buyer or owner, it is important to find a right mortgage broker to make your home buying process easier, because they will definitely help you in finding the most suitable home loan from the selection of lenders.